iPhone X Camera Tutorial Ultimate Guide - Learn to master iPhone X like a pro to take photos, adjust for the perfect shot, shoot video, take a shoot in HDR mode, view photo and video, share the best moment, and print using your best camera iPhone X here in ultimate guide just for you. The iPhone x camera pixels front and rear using an adaptive recognition feature. The camera combine A11 Bionicprocessor in superhuman intelligence learning fast adapt to physical changes in your appearance over time. The wide-angle and telephoto cameras on iPhone X can enable optical zoom, as well as digital zoom of up to 10x for photos and 6x for videos. The iPhone X has two 12MP camera, one is wide-angle and second is telephoto. Both cameras sport optical image stabilization (OIS), which means clearer, more focused shots, even in low-light when the subject is moving in live music photography. The front-facing camera isn't the only thing that got an upgrade on the iPhone X. The rear-facing camera has some big deal improvements, for example, it continuously analyzes video in a million discreet sections to identify things like grass, sky, and motion, and then optimize compression to make sure artifacts don't destroy textures or edges. iPhone X telephoto camera has an ƒ/2.4 aperture for better action shots has advanced pixel processing, wide color gamut, and an image signal processor that works at lightning speed to optimize your photos under almost any lighting condition or low light it can be take a great picture. A new feature in Portrait mode, Portrait Lighting produces impressive studio‑quality lighting effects built with the quad LED True Tone flash camera make the picture perfect, so your subjects aren't washed out and backgrounds look more natural in dark conditions. Apple combined with a digital slow-shutter speed will pushes out short bursts of light to even out the background. Apple's new Slow Sync feature provides is one way professional photographers make to express movement in their pictures. A tiny space houses some of the most sophisticated technology we’ve ever developed, including the cameras and sensors that enable Face ID. Now you able to create beautiful selfies with sharp foregrounds and artfully blurred backgrounds. The front-facing TrueDepth camera has an infrared camera, flood illuminator, proximity sensor, ambient light sensor, speaker, microphone, 7MP camera, and Dot projector that hits 30,000 points on your face. On these iPhone X, the front-facing camera gets a major upgrade in order to support the required technology for Apple's Face ID. All of these sensors, cameras, and hardware upgrades add up to a seriously amazing front-facing camera. It features wide color capture, auto image stabilization, exposure control, and the best part: Portrait mode for selfies (including the new Portrait Lighting). 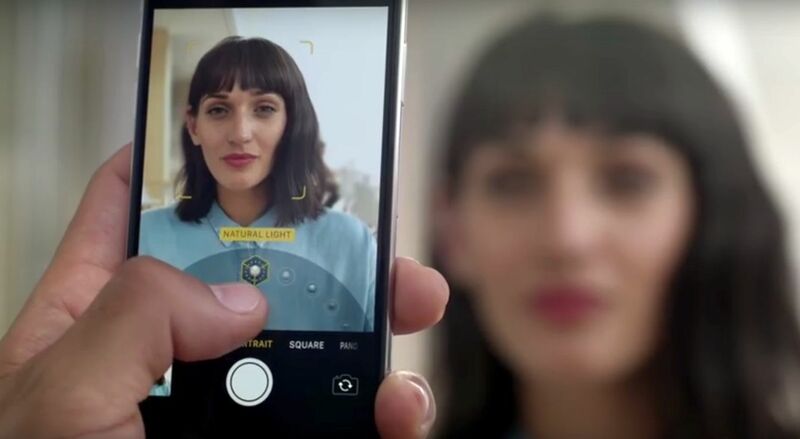 Apple upgrade in camera hardware, the front-facing camera has similar megapixel count as the rear-facing camera on the iPhone 5S (which has 8MP). Though 7MP may not sound like much in comparison to the 12MP rear-facing camera, you shouldn't forget all the bells and whistles of the TrueDepth camera, which makes it pretty darn fancy. The TrueDepth camera in conjunction with the A11 Bionic chip gives you better lighting and clearer focus, which helps with the depth-of-field effect of Portrait mode, so you're selfies will look more like professional photos. You free to share best moment iPhone X selfies into Instagram, facebook, twitter and more and will going to blow up, try it now! The new features in Portrait Mode selfies, which are also enabled by the True Depth Camera. Your portrait with a computationally rendered blur and Bokeh effect applied to it, the bokeh effect is beautiful selfies with artfully blurred backgrounds. The new iOS 11 brings a depth API, you can turn Portrait Mode on or off on any photo you took with it, at any time. You can even use the depthy data for other effects, including Portrait Lightning. The TrueDepth camera iPhone X analyzes more than 50 different muscle movements to mirror your expressions in 12 Animoji. Reveal your inner panda, pig, or robot that TrueDepth camera uses an infrared camera with 30,000 dot projection to take a depth map of your face. The iPhone X camera collecting your data in three dimensions (3D feature). You can use a SnapChat filter to take a selfie with one of the mask filters, it sort of sits on top of your face. Swipe left to open Camera. In this iPhone X ultimate guide, you can take photos and videos with the rear iPhone camera or the front-facing FaceTime camera. To quickly get to the camera, swipe left from the Lock screen. Camera in Photo mode, with other modes to the left and right. Buttons for Flash, HDR, Live Photo, Timer, and Filters appear at the top of the screen. An image thumbnail at the lower left gives access to view existing photos and videos. The Shutter button is at the bottom center, and the Switch Camera button is in the lower right. Choose a photo mode. Camera has several photo modes so you can shoot standard and square-format photos, and panoramas. To choose a mode, swipe the screen left or right, or tap Photo, Square, or Pano. On iPhone X same iPhone 8 Plus and iPhone 7 Plus, you can also choose Portrait mode, which includes a depth effect that focuses on your subject and blurs the background iPhone XS, XS Max also iPhone Xr. iPhone X tutorial Take a Photo. Swipe left on the Lock screen to make the camera screen appear, then take the picture. Press the Home button to return to the Lock screen. Open Camera, choose Photo, Square, or Portrait iPhone X (iPhone 8 Plus and iPhone 7 Plus), then tap the Shutter button, or press either volume button. In Control Center or on the Home screen, press the Camera button, then choose a quick action. 3D Touch gives you another way to interact with iPhone. On supported models, you can press the display to see previews, access useful shortcuts, and more. You can use 3D Touch on the Home screen—press an app icon to see Quick Actions menus. For example, you can press the Camera icon on the Home screen, then choose Take Selfie. Quick Actions work in Control Center too. For example, press Flashlight, then drag the slider to adjust the brightness. The Homes screen blurred, with the Camera Quick Actions menu showing below the Camera icon. On the Lock screen, press a notification to respond to it. In Mail, press a message in the mailbox list for a peek at the message contents, then slide up to see a list of actions. Or press a little deeper to pop the message open. In Photos, press an image to peek at it, then swipe up to share or copy it; press a little deeper to pop the image to full screen. This guide provides more examples of using 3D Touch, which are marked with the 3D Touch icon. With 3D Touch, you can vary the pressure when you draw to change the quality of your lines in some apps. For example, press as you draw in Notes to make a line darker. You can also use 3D Touch to turn your keyboard into a trackpad and select text when typing. To set up 3D sensitivy, go to Settings > General > Accessibility > 3D Touch, then set 3D Touch sensitivity to Light, Medium, or Firm. You can apply a filter before you take a photo in Photo, Square, and Portrait mode. Tap the Filter button, then below the viewer, swipe the filters left or right to preview and choose a filter. You can remove or change filters in Photos. Several filters are displayed as thumbnails for Camera in Filter view, the selected filter has a square boarder around it. To display a grid that can help you align shots, go to Settings > Camera, then turn on Grid. Zoom in or out. (iPhone X, iPhone 8 Plus and iPhone 7 Plus) The dual 12MP wide-angle and telephoto cameras capture full-resolution video and stills at 1x and 2x zoom. To quickly switch, toggle 1x zoom or 2x zoom. You can zoom even further with digital zoom—up to 10x for photos and up to 6x for videos. For finer zoom and to zoom beyond 2x, touch and hold the zoom control, then slide left and right. You can also pinch the screen to zoom in and out. On other iPhone models, pinch the screen to zoom in and out. On iPhone X, choose Portrait mode, frame your subject, then tap the Shutter button. Turn Depth Effect on or off for a photo. View the photo (one that was shot in Portrait mode) in full screen, tap Edit, then tap Portrait to turn the effect on or off. A larger and faster 12MP sensor with new color filter and deeper pixels in a new telephoto camera with OIS. Tip: It’s easy to find photos you captured in Portrait mode that have Depth Effect turned on. In the Photos app, tap Albums, then tap the Portrait album. Use Portrait Lighting. (beta) On iPhone X or iPhone 8 Plus, you can highlight your subject with a stunning effect. In Camera, choose Portrait, then drag the Portrait lighting button to choose the lighting. Natural Light: The face is in sharp focus against a blurred background. Studio Light: A clean look, where the face brightly lit. Contour Light: The face has dramatic shadows with highlights and lowlights. Stage Light: The face is spotlit against a deep black background. Stage Light Mono: Like Stage Light, but the photo is in classic black and white. Camera in Portrait mode, showing the Portrait Lighting options near the middle of the screen. Take a Live Photo. Live Photos captures what happens just before and after you take your photo. On models that support Live Photos, choose Photo, tap the Live Photos button to turn on Live Photos (yellow is on), then tap the Shutter button. The screen indicates the duration of the exposure. You can edit Live Photos in the Photos app. In your albums, Live Photos are marked with “Live” in the corner. Take Burst shots. With the camera in Photo or Square mode, touch and hold the Shutter button to take rapid-fire photos in bursts. Lift your finger to stop. The counter shows how many shots you’ve taken. You can take burst photos with the rear camera and the front-facing FaceTime camera. To select the photos you want to keep, tap the burst thumbnail, then tap Select. Gray dots below the thumbnails mark the suggested photos. Tap the circle in the lower-right corner of each photo you want to save as a separate photo, then tap Done. To delete the burst of photos, tap the burst thumbnail, then tap the Delete button. To choose which burst photos to upload to your Photo Stream, go to Settings > Photos. Take a selfie with Retina Flash. On models with Retina Flash, turn on the flash, switch to the front-facing FaceTime camera, then tap the Shutter button (the display flashes on exposure). Take a panorama photo. (Rear camera) Choose Pano, tap the Shutter button, then pan slowly in the direction of the arrow, keeping the arrow on the center line. To finish the pan, tap the button again. To pan in the other direction instead, first tap the arrow. To pan vertically, rotate iPhone to landscape orientation. You can reverse the direction of a vertical pan, too. On iPhone X Plus iPhone 8, toggle between the 1x Zoom button and the 2x Zoom button to shoot a Panorama at 1x and 2x zoom at full resolution. Camera in Panorama mode. An arrow, left of center, points right to show the direction of the pan. Use the capture timer. Use the capture timer to give yourself time to be in the shot. First stabilize iPhone where you want, then frame your shot. Tap the Timer button, tap 3s or 10s, then tap the Shutter button. You can preserve the last camera mode and photo filter settings you used so they’re not reset when you next open Camera. Go to Settings > Camera > Preserve Settings, then turn on Camera Mode. You can also preserve Live Photo settings on models that support Live Photos. Compress photos to save space. 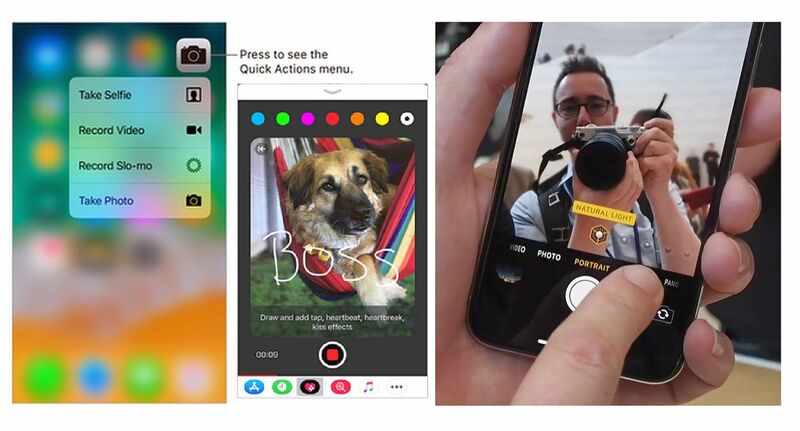 (iPhone X, iPhone 8, iPhone 8 Plus, iPhone 7, and iPhone 7 Plus) To save space, iPhone captures photos and videos in new high-efficiency formats called HEIF and HEVC automatically. To change image and video format settings, go to Settings > Camera > Formats, then choose either High Efficiency (saves more space) or Most Compatible. Take a screenshot. To capture what’s displayed on your screen, simultaneously press and release the Home button and the side button or Sleep/Wake button (depending on your model). Tap the screenshot, then tap Done and choose Save to Photos or Delete Screenshot. If you save the screenshot, you can view it in the Screenshots album or All Photos album (if you’re using iCloud Photo Library). Read a QR code. Camera automatically detects a QR code when it’s in the picture frame. Tap the notification that appears to go to the relevant website or app. About auto exposure and face detection. When you’re taking a photo, a rectangle may briefly appear to indicate where the automatic exposure is set. When you photograph people, face detection balances the exposure across many faces. A rectangle appears for each face detected. Lock the focus and exposure. You can set where you want Camera to focus for your next shot and lock the exposure. Tap the object or area on the screen where you want to focus (this temporarily turns off face detection), then touch and hold until the rectangle pulses. The screen indicates when exposure and focus are locked. Take as many photos as you want. When you tap the screen again, exposure and focus unlock, and the automatic settings and face detection turn back on. Adjust the exposure. Exposure is automatic, but you can set the exposure manually for your next shot. Tap the screen, then drag the Adjust Exposure button next to the exposure rectangle to adjust the exposure. Turn the flash on or off. Tap the Flash button. The True Tone flash on the back of iPhone also provides extra light when you need it. To use it as a flashlight, drag up from the bottom of any screen, then tap the Flashlight button in Control Center. Take a photo within Messages: Frame the shot in the viewfinder, then tap the Take Picture button. Choose a recent photo or video: Swipe left to browse through recent shots. Take a photo or video using Camera: Tap Camera. Choose a photo or video from your Photo Library: Tap Photos. Then, tap the Send button to send or the Remove Photo button to cancel. A Messages window with an overlay at the bottom. The overlay shows, from left to right, the Camera and Photos buttons, the viewfinder, and recent photos. Tap the photo in the message bubble, then tap Markup. Draw on the photo with the Markup tools. Touch and hold the Record Audio button to record an audio message, then lift your finger to stop recording. Tap the Play Message button to listen to your message before you send it. Tap the Send button to send or the Delete Audio Recording button to cancel. Learn more How to Move Contents to iOS 11 from Android iPhone to iPhone X. Note: To save space, iPhone X automatically deletes audio messages two minutes after you listen to them, unless you tap Keep. To always keep them, go to Settings > Messages > Expire (below Audio Messages), then tap Never. Raise iPhone to listen or reply to an audio message. Raise iPhone to your ear to play incoming audio messages; raise it again to reply. To turn this feature on or off, go to Settings > Messages, then turn off Raise to Listen. Forward a message or attachment. Touch and hold a message or attachment, tap More, select additional items if desired, then tap the Forward button. Tap the attachment, then tap the Share button. Copy an attachment. Touch and hold the attachment, then tap Copy. Print photos: on iPhone Xi tap the Share button, then tap Print. To print multiple photos while viewing a photo album, tap Select, select the photos, tap the Share button, then tap Print. Share items from another app. In the other app, tap Share or the Share button, then tap Message.